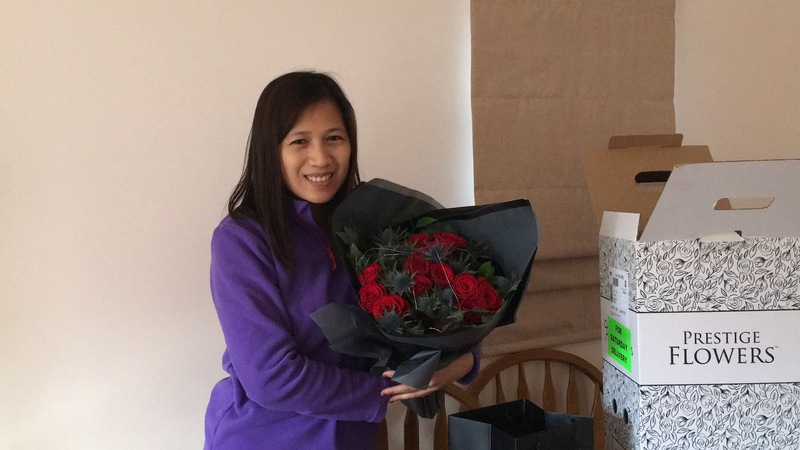 I was sent this special 12 red roses bouquet from prestige flower’s range. That feeling of receiving a beautiful bouquet of flowers makes me feel so special. I was impress how quick the delivery was, it really is next day and required the receiver to sign which makes it even more special. This is a perfect gift for Valentine’s Day for your loved ones, it even comes with a free small truffle chocolate and you can personalised your special message as well in a little note card which is a lovely touch. It is received in a box with the prestige website printed on it so you know it is flowers. As you open the box, you can see the flower bouquet inside carefully wrapped and put in a gift bag. The gift bag has a long handle on each side so that you can pull the bag out of the box which is good way to avoid any damage to the flowers. The flower are fresh and arranged beautifully so it looks nice and presentable, it also comes with few vouchers and flower care guide. When I unwrapped the flowers ready to put in the vase, the stem were all nicely cut and it’s fresh as is still wet at the bottom. As I put them in our dining table, it made me feel special, loved and happy. The flowers seems to have a positive effect on our moods. Definitely a very nice experience from prestige flowers. I would highly recommend them. Now that Valentine’s Day is coming, check out their wonderful range of Valentines flowers on offer that will surely delight anyone. It might be the perfect Valentines gift for your loved ones. Thank you! Yes shame I did not manage to capture that but I have taken a picture of it. I will add it on the blog post. It is indeed beautiful 🙂 thank you.